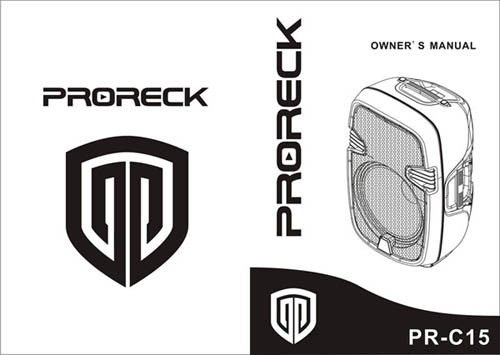 The PR-C15 features Bluetooth /USB/SD Card Reader/ FM Radio functions, allowing you to enjoy the versatility of this unit. More attractive, the PR-C15 has a LCD display clearly indicating the mode you choose with the remote control function allowing you to switch the mode when you are far away. In addition, the built-in LED lights provide a brilliant light show for your party. The unique color comfortably matches to your venue’s color scheme. The PR-C15 is equipped with a 1/4" Mic jack, XLR and Stereo R/L RCA inputs as well as XLR line output. This XLR line output allows you connect to an external audio device for stereo sound. With two transport wheels at the bottom, you can easily move the speaker to anywhere. A 35-mm pole socket is provided to mount onto the speaker stand for a better stereo experience.